Police are investigating the stabbing death of a 55-year-old woman, with the victim's daughter as the only suspect. At 11:23 p.m. Wednesday, emergency medical officials responded to a report of an unattended death at 99-462 Paihi St. in Halawa Heights. The woman, whose identity was not released, was found with multiple stab wounds. A man living with the victim and suspect had left the house at about 7 p.m. and returned to find the victim dead. The city Medical Examiner's Office is not yet releasing the woman's identity. An autopsy determined she died of strangulation and stab wounds to her neck and thorax. Police recovered three bloody knives at the scene, but "whether or not they were in fact the weapons that were used to perpetuate the crime, we don't know," said police Capt. Frank Fujii. The suspect, a 25-year-old woman believed to be the victim's daughter, was arrested at 2:45 a.m. yesterday at the Pearl City Police Station in connection with the second-degree murder case. The suspect does not have a criminal history in Hawaii, and police are investigating how long the two had lived in the state. Police said they are investigating a motive in the homicide. "I have received no reports of any argument of any sort prior to the witness leaving the house and returning," Fujii said. There are no other suspects being sought, he said. Fujii would not officially confirm the victim and suspect's relationship, but police sources said the suspect is the victim's daughter. The case is the Honolulu Police Department's 12th homicide case of 2007, double the total of six cases at this time last year. There were 18 homicides in 2006. "Of those 12, we have arrested and charged 11 of them," said Fujii. "So we have been closing cases." 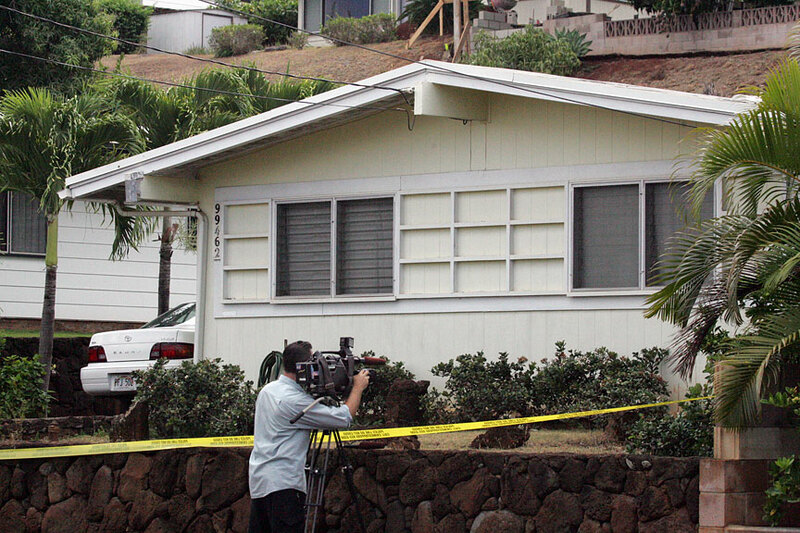 A 56-year-old woman's beating death in Kahana Bay remains this year's only unsolved homicide case. Linda Hannon was found severely beaten face down near the Kahana Bay fishpond on Feb. 25. 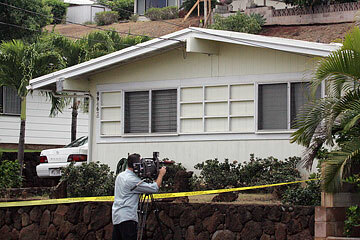 The Halawa Heights home was cordoned off with crime scene tape yesterday as investigators combed the area. Neighbors said they did not notice or hear any signs of struggle during the night of the killing. 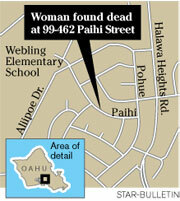 Longtime residents of Paihi Street said they did not know the suspect or victim because they had moved in recently.